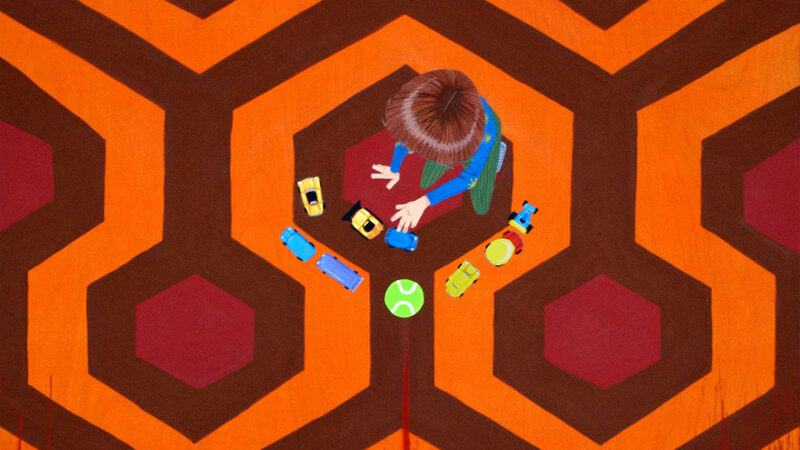 Room 237 is not about The Shining. It is about those lost in its labyrinth. For better or for worse, Stanley Kubrick is one of the most potent gateway drugs for young cinephiles, and for many the early obsession proves lifelong. The addictive nature of his films is partly due to their own air of grandeur and carefully-crafted perfection, but the the popular perception of Kubrick as a total mastermind sweating every single detail of his films is belied by some accounts, such the surprisingly seat-of-his-pants making of 2001: A Space Odyssey. And the weight of reputation and self-seriousness often disguises the satire and sometimes even silly wit. Personally, I was exposed to 2001: A Space Odyssey as a child, and it wasn’t until years later that I realized how much of it was intentionally funny. Perhaps even moreso than 2001: A Space Odyssey, The Shining is treated as a kind of holy book by a clique of cranks. And like all holy books, The Shining is big, deep, and rich enough to support almost any interpretation one might bring to it. If one looks hard and long enough for something, one will find it. These Shining superfans evince little distinction between conscious authorial intent vs. after-the-fact critical deconstruction by outside observers. What is for most movie buffs a fun parlor game of spotting continuity errors is for them a deadly serious matter of asking what it all meeeeaannnns, man. In particular, the symbolism of the Overlook Hotel’s garden labyrinth tempts an examination of its indoor floorplan, which is indeed full of evident inconsistencies. But rather than consider the challenges of building a movie set, it’s more fun to read it as an exploration into the psychogeography of madness. Some of the obsessives make interesting observations, but often undercut themselves. For instance: one egomaniac believes he has “solved” the film as Kubrick’s coded confession that he was involved in faking the Apollo moon landing footage. He interprets the hotel key lettering “ROOM No.” to be an anagram for “MOON”. He forgets “MORON”.